Former British taekwondo champion John Cullen says not selecting Aaron Cook for London 2012 would be like "Barcelona not picking Lionel Messi". Commentator Cullen, who trained with Cook until retiring in 2007, was reacting to reports that Cook is appealing against a decision by GB Taekwondo to nominate another athlete. "He has to go," Cullen told BBC Sport. "Aaron's the world number one and is in form. If it was any other country in the world, he would be picked." Cullen added: "If they have made this decision and it's not a sporting decision, or justifiable decision, then they have to be held to account." European champion Cook, 21, quit the GB set-up last year following his "embarrassing" first round exit at the World Championships. Although he said it was a "difficult" decision, rumours of unrest had surfaced earlier in 2011 with the British champion said to be unhappy with new defensive tactics he was being asked to use. Over the last 12 months the Dorset-born fighter has funded his own training programme and created "Team Cook" with the clear aim of winning gold at this summer's Games. Nine tour titles, including victories at the Olympic test event and European Championships, suggest that approach is working - but Cullen believes there is a wrong perception within the GB Taekwondo camp that Cook's success reflects poorly on them. "With Sarah Stevenson, Jade Jones, Martin Stamper and Michael Harvey all winning major world medals, to say the academy doesn't work would be spurious because it clearly does," he said. "But it should be big enough and strong enough to accept that it doesn't work for everybody. "Look at the Brownlee brothers, or Mo Farah, or any of these elite athletes who all do their own thing. 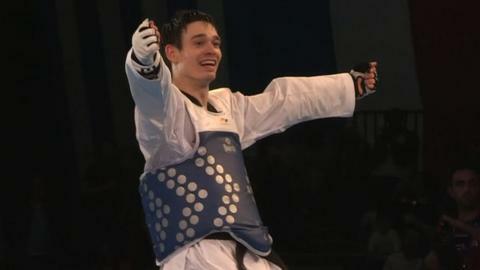 Taekwondo is an individual sport and Aaron is better working with his own coach." Going it alone has come at a cost for Cook: it is believed he has invested well over £100,000 in funding his Olympic dream. "He's spending his pension," said Cullen. "Aaron knows the sponsors won't always be there and that after London it will be tougher, but that's how committed he is to the sport." Although neither Cook's management team nor GB Taekwondo were available for comment on rumours that Lutalo Muhammad is now the lead -80kg candidate for the Games, the sport's national governing body issued a statement on Wednesday. "A decision has been taken by the British Olympic Association (BOA) and the sport to delay the announcement of the GB Team," it read. "This means that the announcement event scheduled for 25 May in Manchester has been postponed and a new date will be advised in due course." The BOA has confirmed to BBC Sport that athlete selection for London 2012 needs to be completed by 6 July, which does allow extensive talks to continue. Cullen, however, believes that although Muhammad is a talented fighter, the decision should be clear. "He [Cook] is the world number one and has been the poster boy for our sport. It's like Barcelona not picking Messi. In fact, he is the Lionel Messi of our sport and must go."